Make a difference in your community through volunteerism at Native American Connections. There are several ways you can contribute your time and talent. Businesses/corporations, service organizations, clubs, churches, charity leagues, etc. 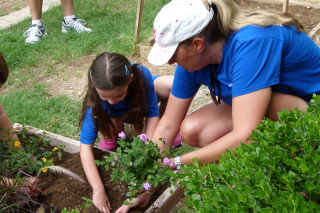 On- Site Volunteerism: Participate in a volunteer activity or project at one of our sites. Off-Site Volunteerism: Coordinate your own service project to benefit Native American Connections at a location of your choice. (e.g. schools, churches, workplace).These projects can include collection drives where you assemble hygiene packets, pick up extra harvests from local farmers markets, etc. To organize a collection drive see a list of our most needed items on our Wish List (Downloadable Wish List) or call the Donations Coordinator at (602) 254-3247. All levels of time commitment are welcome. Feel free to participate in a single volunteer experience or if you have more time and can make a longer commitment we can have needs that can extend for a few weeks and up to a few months. Provide general administrative support filing, answer phones, light data entry, etc. Some experience and skills may be required. Keep our Donations Center and Closets in tip-top shape by helping to inventory, sort, organize and store. Cook: Work with the Chef to prepare apre-planned meal and serve the residents. Dinner and breakfast shifts are available. Chop & Create: Help the Chef with food preparation and create meals in advance for busy days. Host-a-Meal: Sponsor a pizza night, order in from your favorite place or bring a homemade meal for residents. Adopt-A-Room: Brighten up the days for our residents by “adopting” a residential or community room that is in need of new paint, furniture or linens. Enhancement and Maintenance: Lend a hand on one of our Grounds & Building projects which may vary from planting, painting, installing a garden, etc. Contact us for more detailed information about these and other Special Events. Receive more details for each volunteer opportunity by contacting the Volunteer Coordinator by phone or email. Do you have an idea of your own? We want to hear it. After your form is received, the Volunteer Coordinator will contact you to finalize your volunteer experience. If you have any questions, please contact Native American Connections at 602 254-3247.